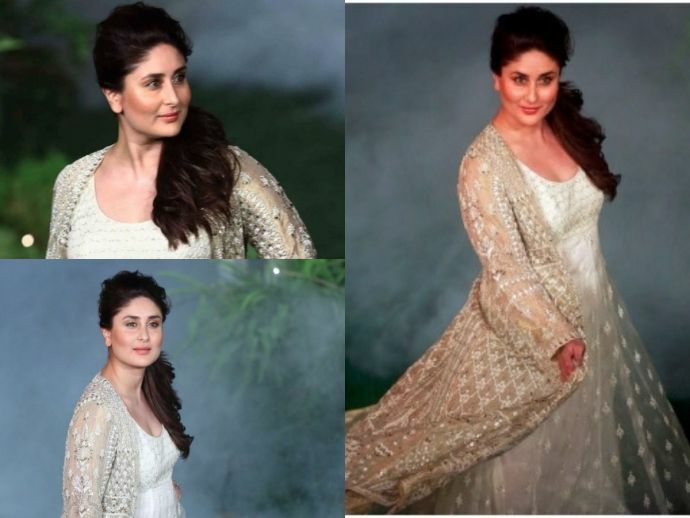 46 days after giving birth to Taimur Ali Khan, Bebo is back on the ramp again. The new mommy Kareena Kapoor Khan proves that motherhood is not a barrier for her career by walking the ramp in Lakme's Fashion Week. In contrast to this, at the time of pregnancy, most of the celebrity moms like to hide from the shutterbugs and prefer to stay away from the paparazzi. She not only continued her work and public appearances but also made a style statement, with her very own ‘Maternity Wardrobe’. Recently, only after 46 days of giving birth to a newborn, she walked as a showstopper for Anita Dongre, in Lakme Fashion Week (LFW) Summer/Resort 2017. The actress looked stunning in the gorgeous beautiful gold and white ensemble from the Alchemy collection. This Udta Punjab actress walked with elegance and style at the LFW which was held at the heritage structure of Bandra Fort. Bebo is also the face of Lakme Absolute. During her pregnancy, she walked on the ramp last year for Sabyasachi Mukherjee at the grand finale of Lakme Fashion Week Winter/Festive season.